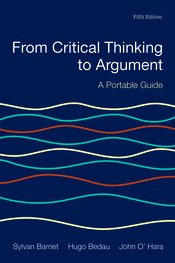 From Critical Thinking to Argument is a very brief but thorough guide to critical thinking and argument. With only fifteen readings, this affordable guide can stand alone or complement an anthology. Comprising a condensed version of the text portion of the widely adopted Current Issues and Enduring Questions, it draws on the authors’ expertise in persuasive writing and logical thinking, and now with new co-author John O’Hara, an expanded focus on critical thinking. It helps students move from critical thinking to argument and research. This versatile text features treatment of classic and modern approaches including Aristotelian, Toulmin, and Rogerian argument, as well as an expanded chapter on visual rhetoric. Like other volumes in the Bedford/St. Martin’s popular series of Portable Anthologies and Portable Guides, From Critical Thinking to Argument offers the series’ trademark combination of high quality and great value for teachers of writing and their cost-conscious students.